My God, 42nd Street Is Full Of A Star! Twice a year in New York City the setting sun aligns with New Amsterdam's east-west streets. It's called Manhattanhenge, and last night we were on hand to see it — with Rocketboom bringing you some amazing video footage below. 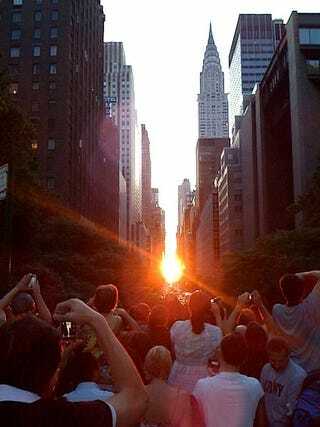 Manhattanhenge (sometimes referred to incorrectly as "Manhattan Solstice") is a biannual occurrence in which the setting sun aligns with the east-west streets of Manhattan's main street grid. The term is derived from Stonehenge, where the sun aligns with the stones on the solstices. It was coined in 2002 by Neil deGrasse Tyson, an astrophysicist at the American Museum of Natural History. It applies to those streets that follow the Commissioners' Plan of 1811, which laid out a grid offset 28.9 degrees from true east-west. At sunset, a traveler along one of the north-south avenues on the West Side looking east can observe the phenomenon indirectly, being struck by the reflected light of the many windows which are aligned with the grid. An observer on the East Side can look west and see the Sun shining down a canyon-like street.